Last year at this time, we put an offer in on our house. We received a closing date of December 6th and got to work packing. We thought we would be in our house before Christmas. Instead, Christmas decorations looked like stacks of moving boxes separated from the boxes of family gifts I needed to wrap. We ended up moving at the end of January. It all worked out for the best but I did miss decorating for Christmas. With our little girl due the day before Thanksgiving, we’ve been given a lot of advice to get the holiday decorations up before she arrives, otherwise, it probably won’t happen. It’s one of the most common things people say when they ask our due date. With all the work on the house and freelance work to finish up before mid-November, even getting things decorated beforehand seemed impossible. 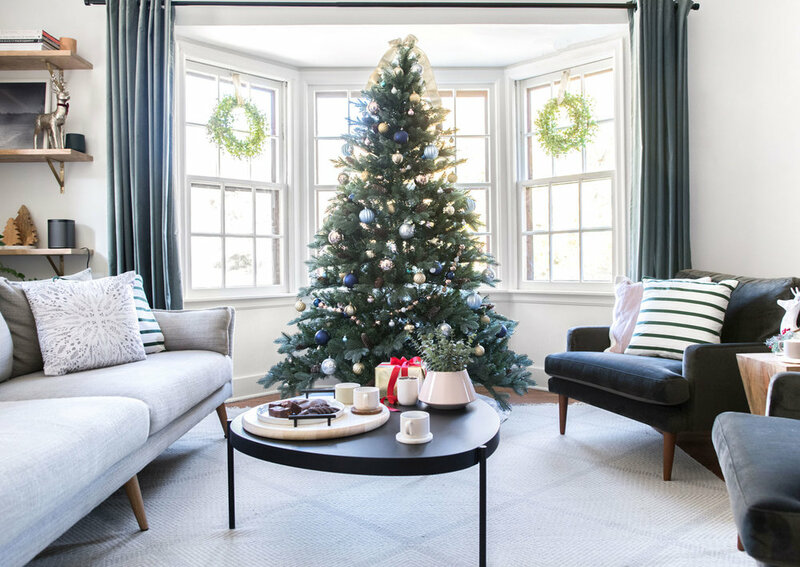 So when Lowe’s Home Improvement invited us to create a holiday decorating story in our house using their decor, it was a perfect final nudge to get us going. On Saturday, Austin and I drove out to Lowe’s and picked up the decor we needed to turn on our home’s holiday-mode. I wanted to keep the color palette similar to what we already had in our house so we could incorporate winter decor without having to move too much out of the space. We wanted to play up the cedar green chairs, the light blue rug, the mix of metallics and blush accents. We found a great selection of things and over the weekend, I got to work setting it all up. 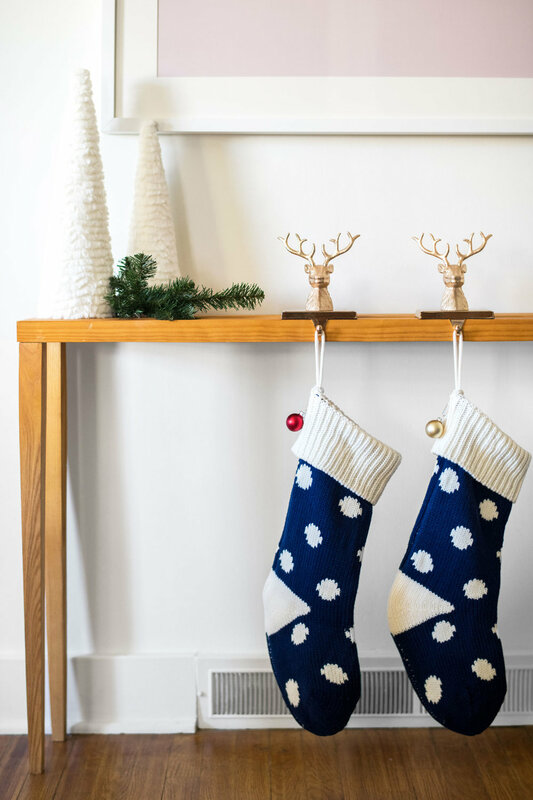 These blue knit stockings coordinated with the deeper blue ornaments on the tree. Things like buying an extra stocking are making things feeling very real that we are going to be a family of three soon. I love that these gold reindeer stocking hooks can look more modern or more traditional depending on the setting. I took two garlands and attached them in the middle for an over the door decoration. I made a bow to cover the ends. I’m drawn to simple styling when it comes to holiday decor so these white, furry trees and a sprig of faux pine were the perfect touch on this console table. To personalize the stockings, I chose three different colored ornaments and attached them to the sides. The 7-foot tree fit perfectly in our bay window. I love that it’ll be seen from the street since we might not have time to decorate the exterior for Christmas. I love a mix of greens and since we like to have bouquets of fresh eucalyptus around the house, I chose faux eucalyptus wreaths for our windows. Our living room shelves were rearranged a bit to include some holiday-themed objects. I love the fun holiday pillows that Lowe’s had available online. These two work so well together and could even stay out after the New Year since they aren’t too holiday specific. Since our living room is furthest from the kitchen, I thought it’d be functional and pretty to create a tray out of one of the circular boards from the furniture grade wood selection at Lowe’s. The handles are cabinet pulls from the kitchen hardware section. The living room looks so cheery and ready for the holidays. We decorated our tree with three different ornament sets to create a less formal but still cohesive look. One set had light blue, dark blue, rose gold and gray larger ornaments, one had different textures and sheens of gold medium-sized ornaments and one had multicolored miniature balls in shiny and matte. The tree itself is pre-lit with white bulbs, looks incredibly real and has pinecones dispersed throughout. It feels kind of surreal that our house is decorated for the holidays. They seem so far away but I know they will be upon us so soon. Time is moving quickly and I love being in the Christmas spirit.